My only excuses are the usual: 1) work and family life taking over (happy with family doing that, but as for work…!) 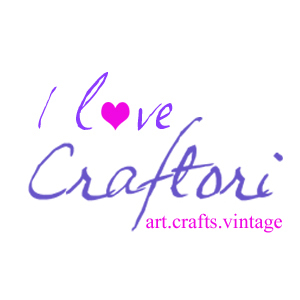 and 2) I’ve been busy with craft fairs and my Etsy shop. This embroidery hoop art is made using hessian (burlap) and scrap fabric, which I’ve upcycled from curtain fabric samples. I used free machine embroidery to applique the hearts to the hessian and make the strings. I love the cute rustic look of this piece, ideal for lovers of shabby chic decor. This green spotty fabric is the perfect backdrop for my cute birdcage hoop. Again, I sketched the birdcage design using the sewing machine without a presser foot. It’s quite hair-raising when you first try it, but I’m addicted to this technique now! 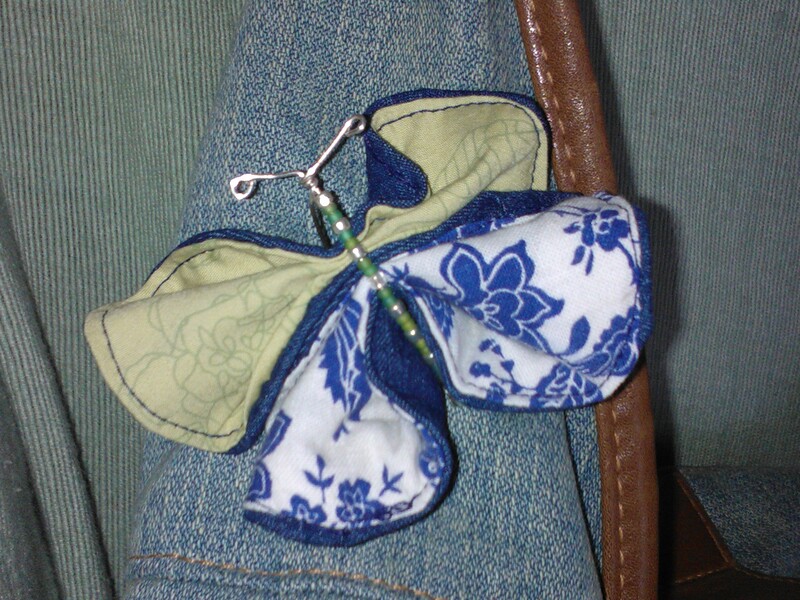 The flower is a piece of scrap ribbon and a little bead, and a bead also makes the upcycled fabric bird’s eye! Here are my most Christmassy designs, which I’m hoping will attract someone’s eye at my forthcoming craft fair next weekend (details here) or on my Etsy shop. To make these Christmas themed hoops, I used both free machine and hand embroidery and some felt. 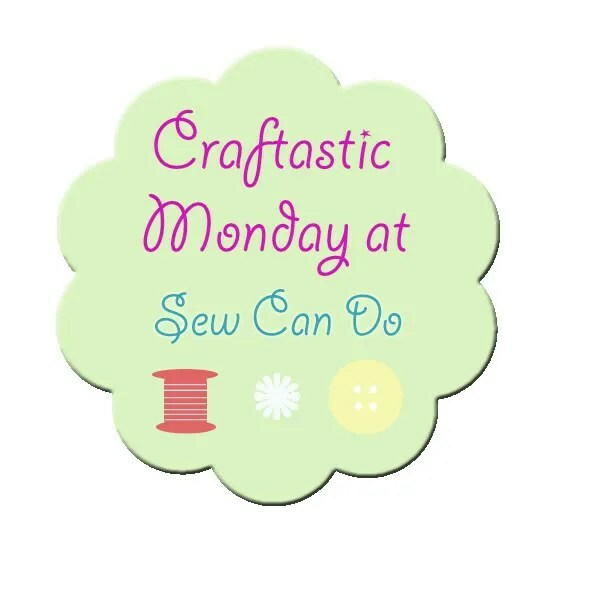 I love using felt as it’s such a versatile fabric and of course non-fraying. I love the print on this fabric and the little sequins! 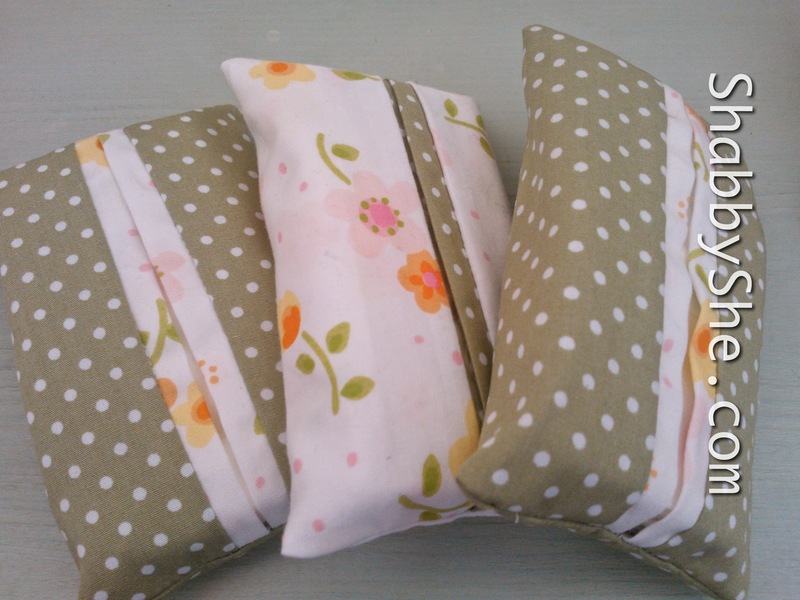 These spotty and flowery fabric ones incorporate one of her cotton tops which was so pretty but only worn a handful of times, as it was sleeveless and rather a chilly summer that year! 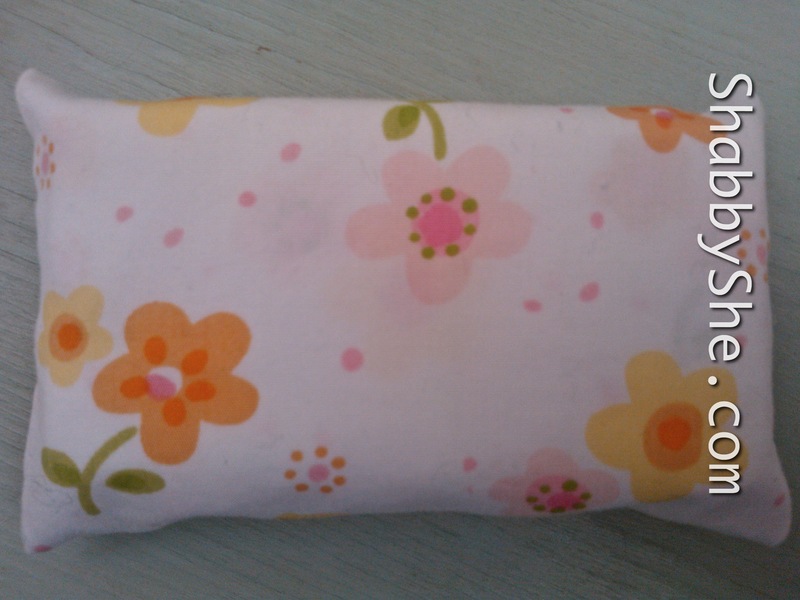 The sunglasses cases are made using flex-frames – I spent ages googling to find out the name of these pinch-open pouch closures!! 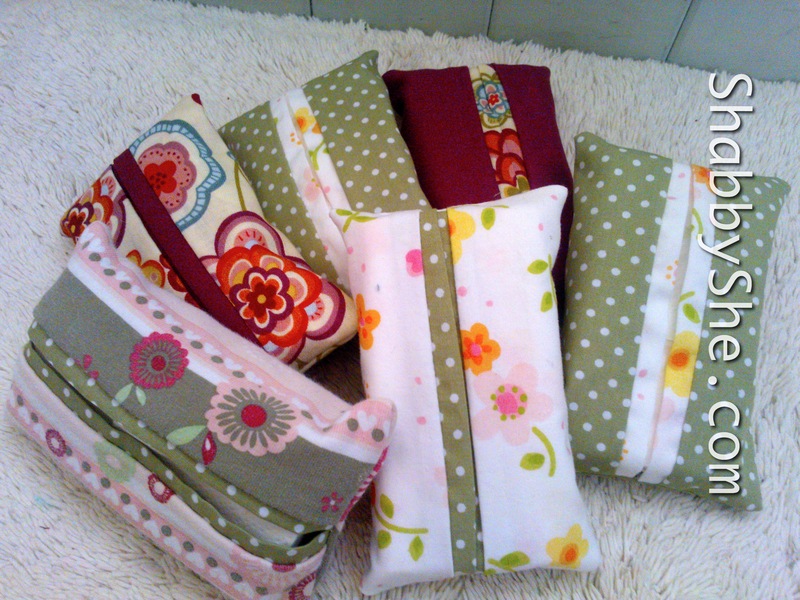 Again there are stacks of great tutorials online – I used this one from Fabric Yard (where you can also buy sewing supplies) as it’s got great step-by-step pictures and instructions. 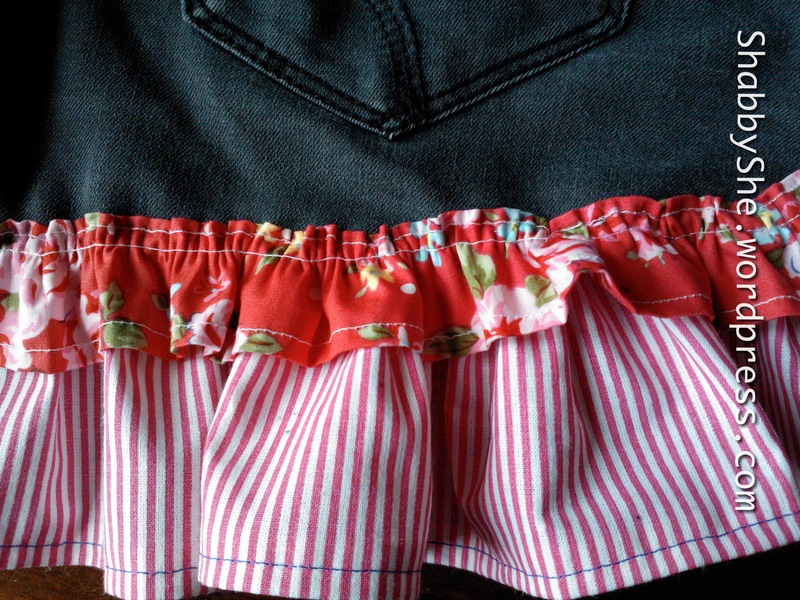 By the way, this tutorial says to spray baste the wadding to the fabric – I used a light smattering of fabric glue which seemed to do the trick. Always use what you have to hand, I say! 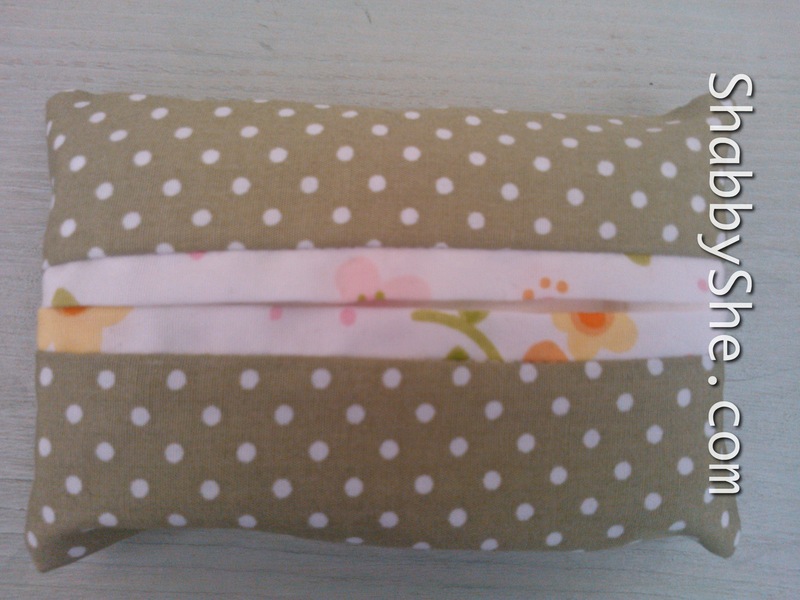 The glasses cases are also good practice for quilting – a technique that’s quite new to me. It was a fun way to try out different styles of quilting on a small area of fabric before trying a bigger project. Most of the glasses cases pictured here were made with repurposed fabric from clothing – there are pieces from two men’s shirts, a little girl’s dress and a couple of tops in use here, plus some gorgeous stripy turquoise fabric from a sample book. 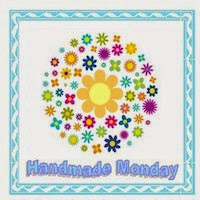 This week I have been mainly trying to complete a couple of WIPs (works in progress) without getting distracted by the fantastic crafts I’ve seen on some of the blogs I follow! Ideas like The Renegade Seamstress’s beautiful sweater boots which are so tempting with the cold snap we’ve been experiencing recently in south east England, or trying free machine quilting as demonstrated so cleverly by Sewchet. However, I recently started wading through my ex-denim jeans stash to make up some more denim pocket purses and I really want to get something finished! 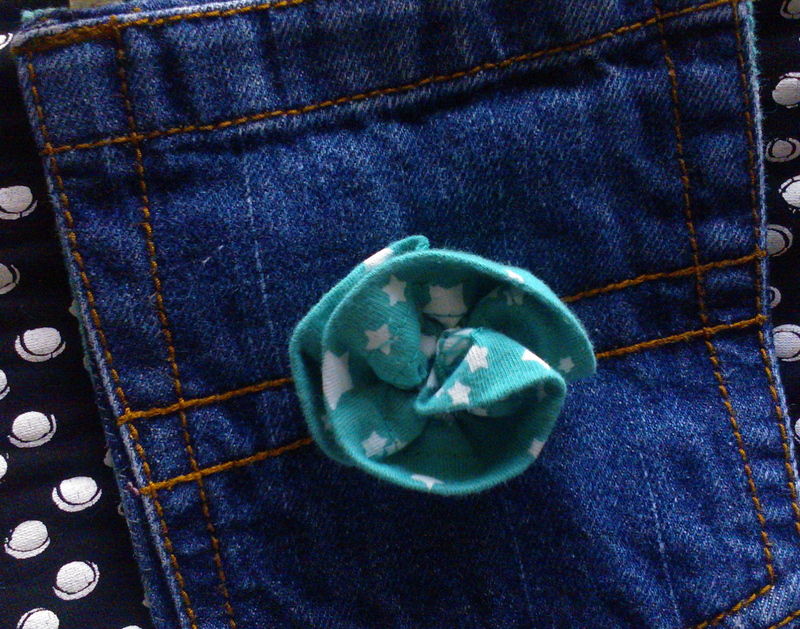 Firstly this cute mini pocket which belonged to my daughter’s age 3-4 jeans. 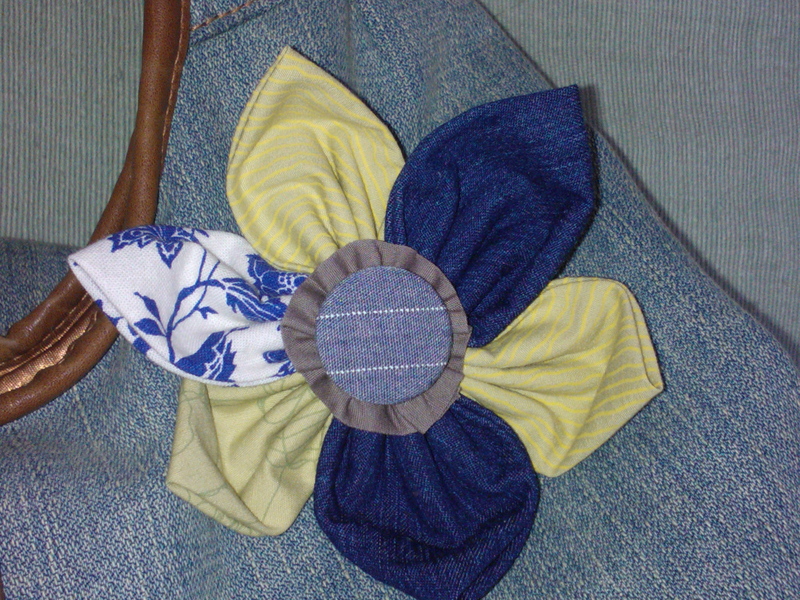 The flower was an experiment with a new method for making scrap fabric flowers: using a circle of fabric, I sewed a running stitch around the perimeter then pulled it as you would a drawstring bag and knotted the ends. Then I pressed it flat and it made this lovely effect – almost like a pinwheel I think! The button already had a nice bright cover which complements the fabric. Not exactly finished, but on its way! 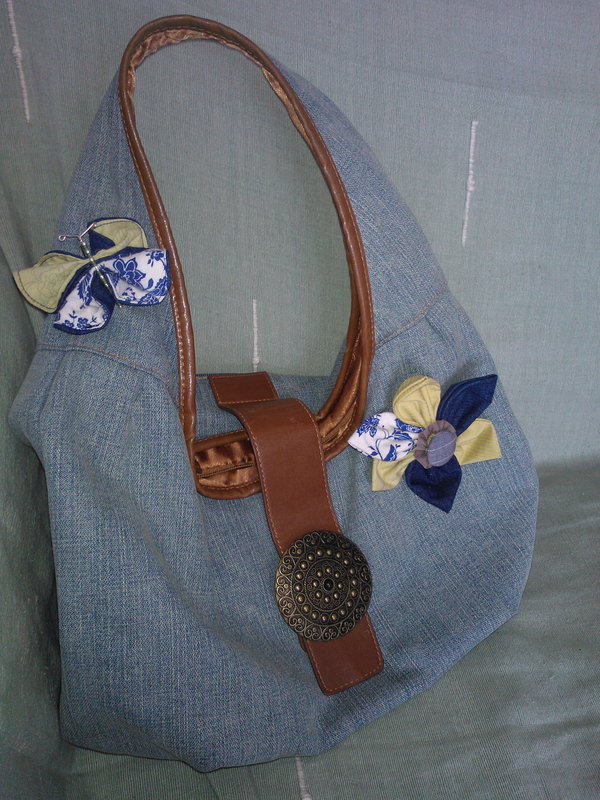 I had more success with this denim purse, which I have Actually Finished!! 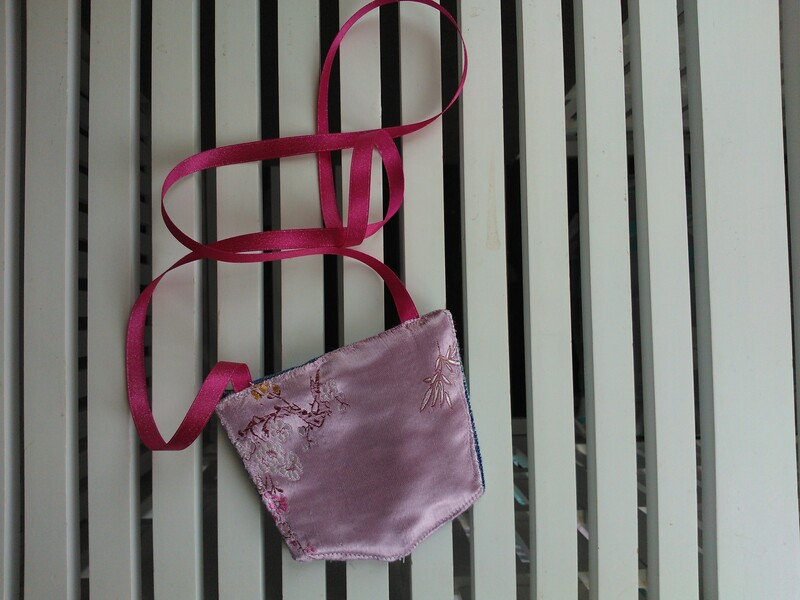 I used the same upcycled fabric on the front of the purse to make a little flower – this one uses the hem of the original t-shirt and stitched it into a coiled flower shape. I was rather pleased with the effect. 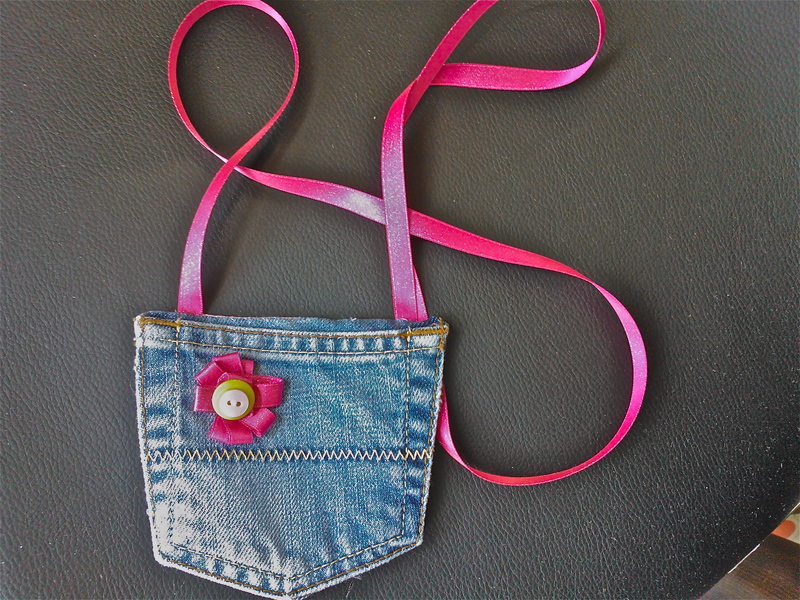 A thin ribbon strap was the last piece of the jigsaw and the denim pocket purse is complete. Hurrah! Now Summer is here with a vengeance in South East England I wanted to make something both useful and summery. 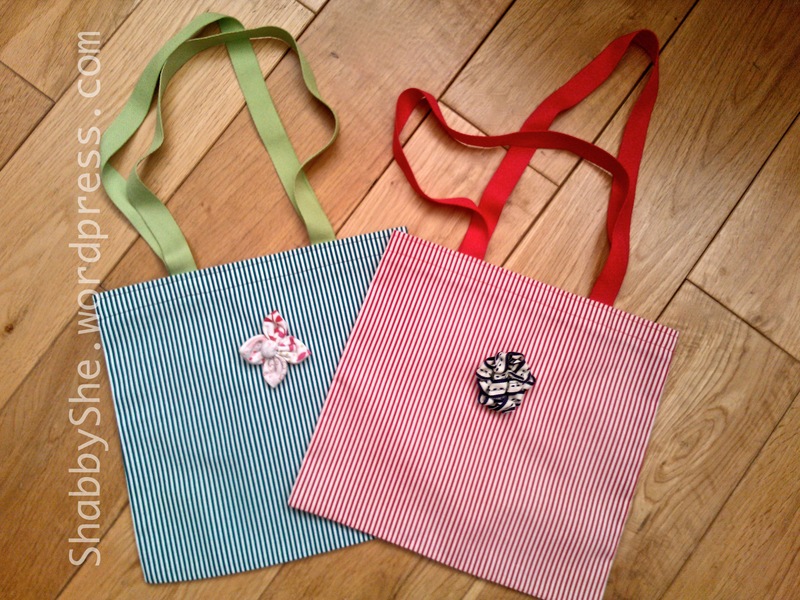 These tote bags are based on instructions from the excellent Molly’s Sketchbook Twenty Minute Totes. I hasten to add that 20 minutes is I’m sure achievable for a more experienced and less faffy seamstress than me, but they took me over an hour! Still, they were easy to assemble with fab instructions and visuals from the Purlbee and I think are super cute! I can’t wait to give them to the teachers! 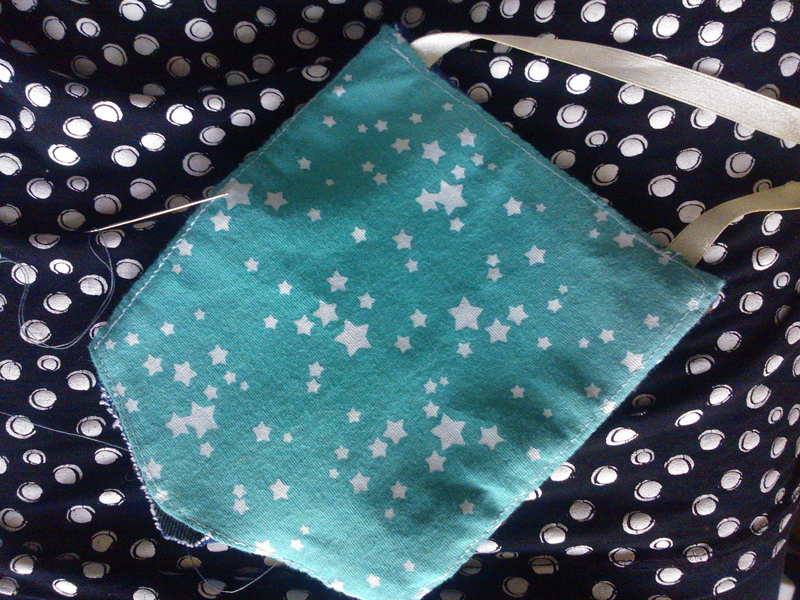 I bought some fat quarters from Hobbycraft in coordinating colours and used thread from my stash. They’re mostly *new* (rather than upcycled) apart from the fabric flower on the teal striped bag which is made from a repurposed dress and top of my daughter’s. A warning word about the fat quarters: I thought they were a standard size, but apparently can vary depending on the width of the original fabric. 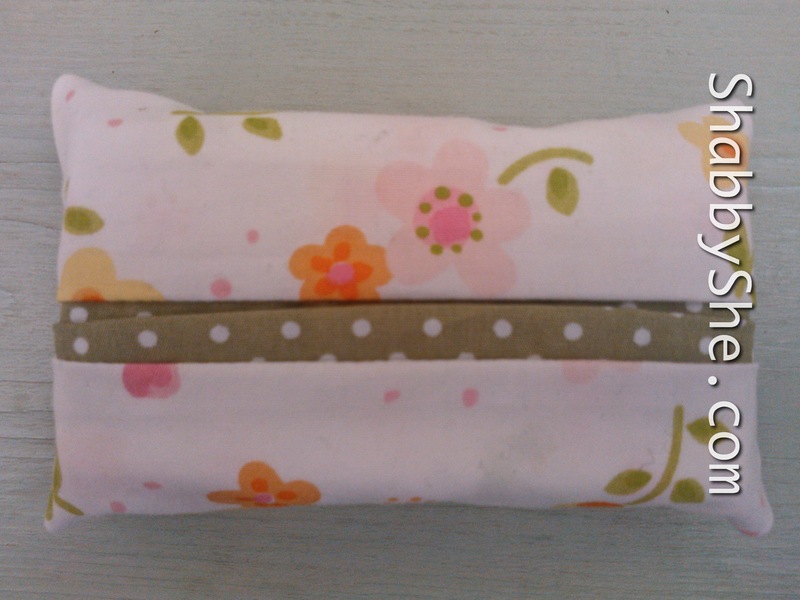 The tutorial above uses fat quarters that are larger than mine, so I had to adjust my measurements down from 14″ x 16″ to 11″ x 11″ – quite a difference, but the resulting bags are maybe sweeter for it as they’re little! Denim patch to hide stitching! 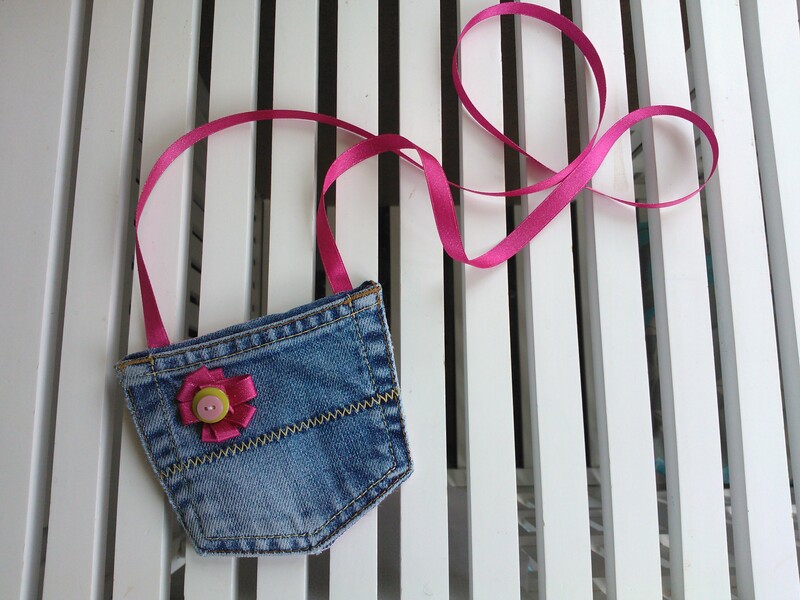 Another lovely upcycle project for all those sweet little pairs of jeans which are no longer worn by the children – denim pocket purses! 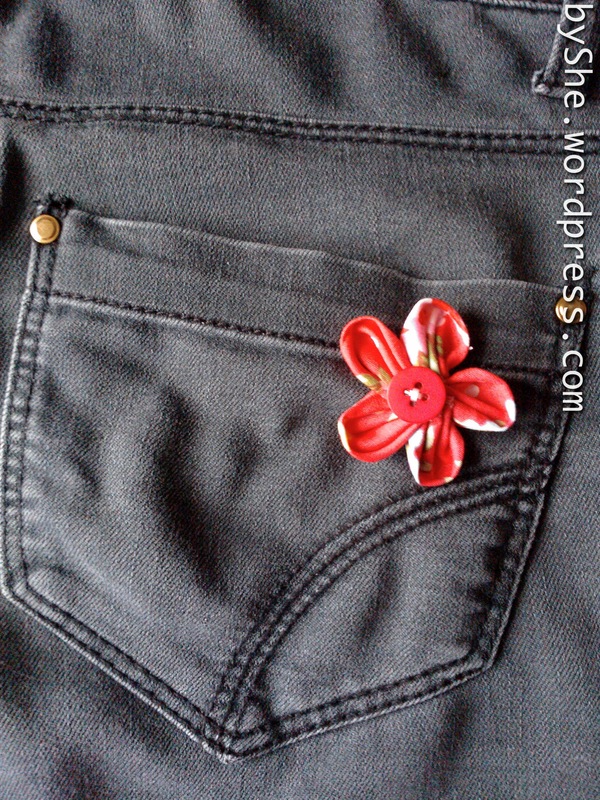 I made the strap from a piece of hot pink decorative ribbon I had in my stash, and used the remainder to make a little flower featuring a double-button centre. The back of the purse looked a bit unfinished as it was just the inside of a pair of jeans, so I traced the shape onto card and made a fabric patch the same size to finish the back. The fabric on the back was another crafty repurposing of fabric – it was a beautiful Chinese-style dress which my daughter point blank refused to wear!! 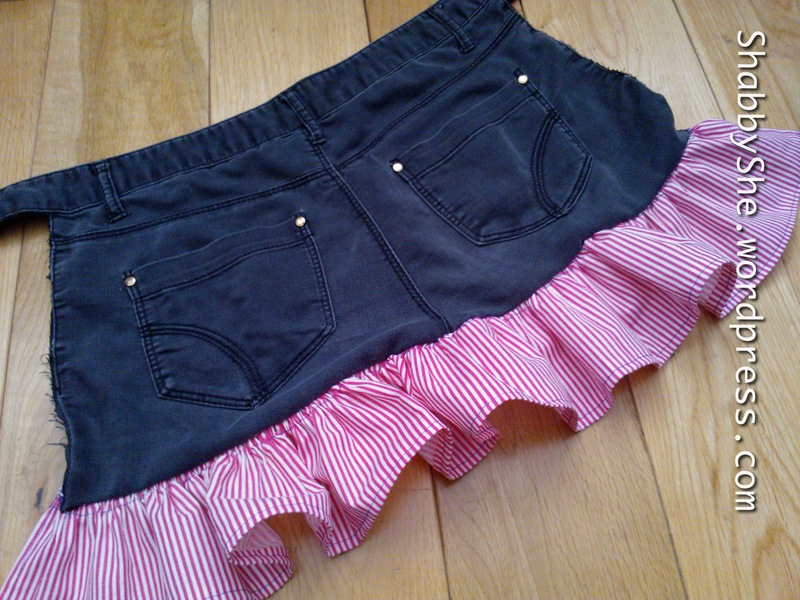 However even though it was lovely the very narrow fit hardly suits a typical D-shaped toddler tummy! 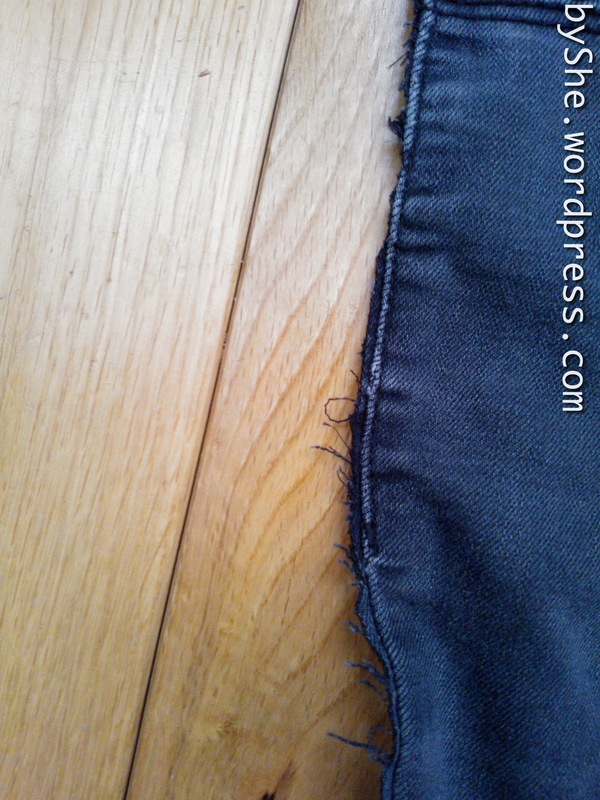 The fabric is very delicate and sheds easily so I carefully hemmed it before stitching it to the denim pocket. 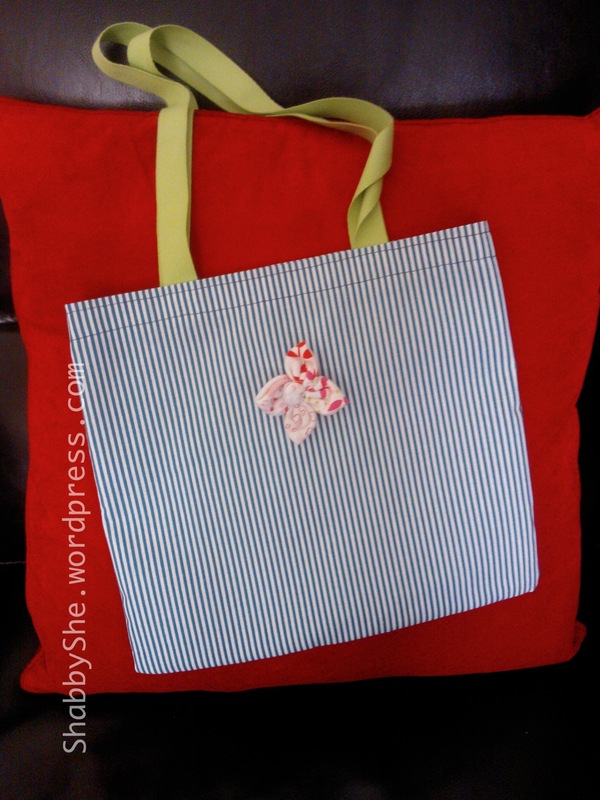 I'm going to make several more in different fabric finishes and possibly try a craft fair later in the year – especially if I can team up with one of my crafty friends. It makes it much more fun! 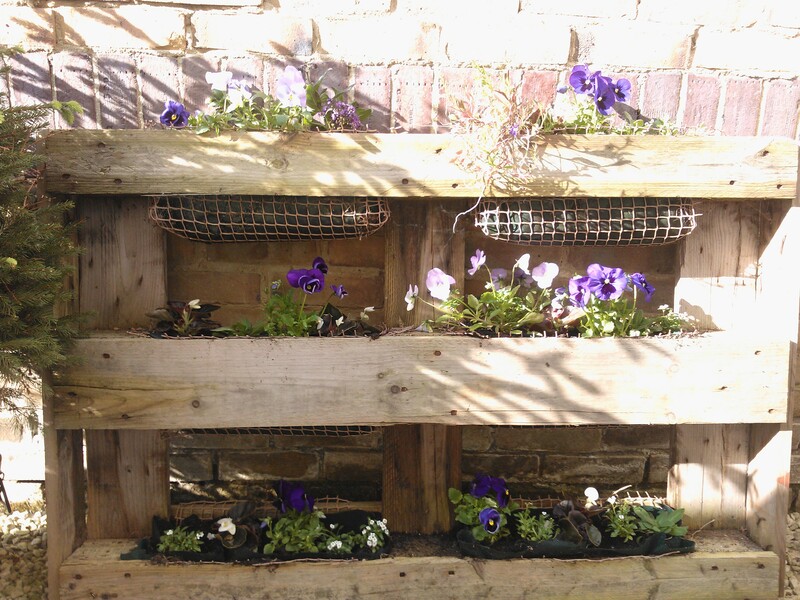 How weird is this…I decided to update my Vertical Pallet Garden with some fresh Spring-into-Summer flowers and as I checked back on how it looked last year I find it’s exactly a year ago to the day that I posted about this garden upcycling project!! 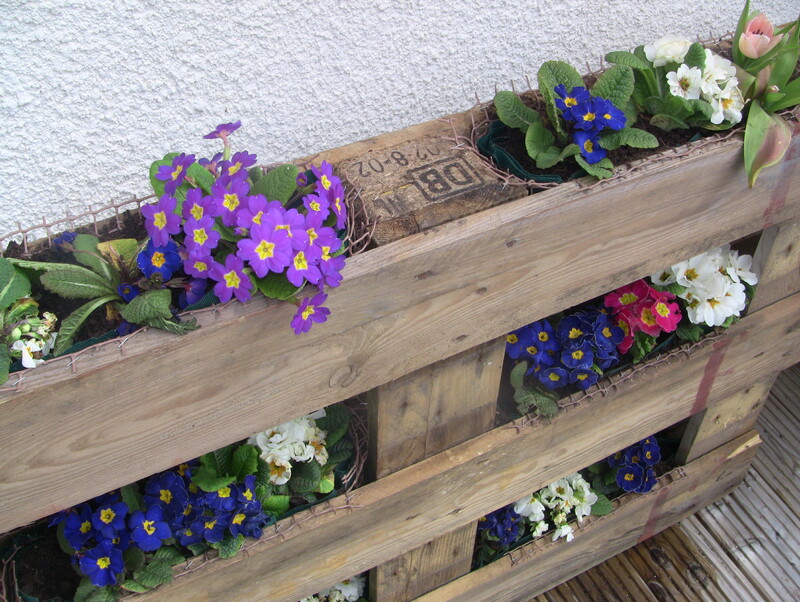 As you can see, the pallet itself has weathered in nicely over the year giving it an even nicer Shabby / antiquey look. Since planting last year I moved it to lean against the garden wall where it can enjoy more shade than its previous south-facing position. As our soil here is so light and sandy and doesn’t hold onto moisture, small plant containers like the ones we created in this pallet need all the shade and water they can get! I decided to go for just blues and whites this year, reminiscent of Royal Doulton blue and white china which I just love. They look so blue in the evening light, in which the picture above was taken, but looked more vibrant and purple in the brilliant sunshine we had over the weekend. Each petal is a circle of fabric (I used a jar lid as a template) which is folded into quarters and sewn with a continuous running stitch along the curved edge: the same thread is used to join all petals together and then gently pulled tight to make the flower shape. I then used the same fabric to create a complementary butterfly brooch using some silver-plated jewellery wire I’ve had about 20 years (not kidding!) and some little beads. 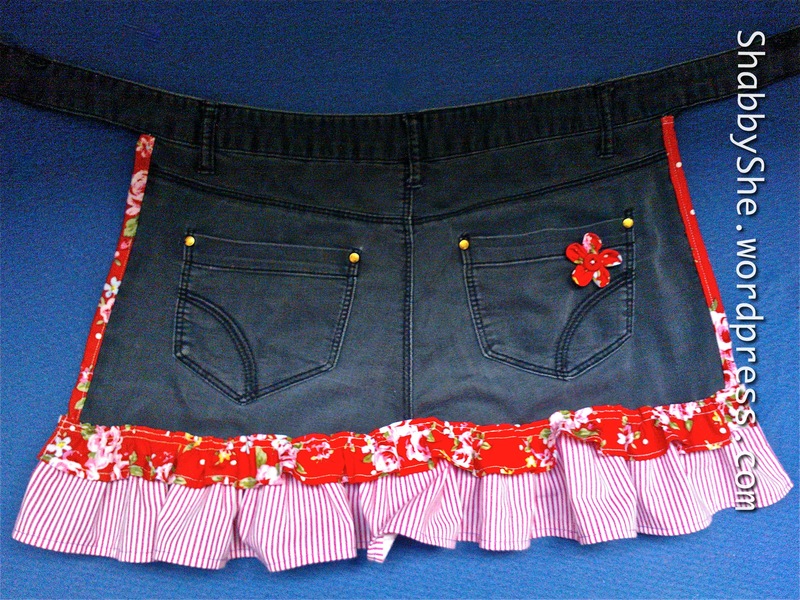 A nice way to create something new from scrap fabric – what do you think? This project was really fun to do as it allowed me to play with the glue gun. 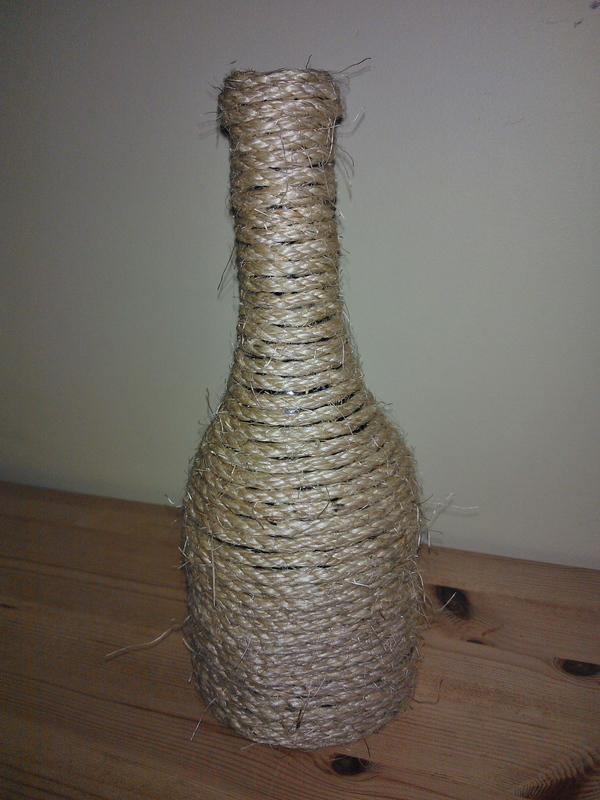 Simply take an old wine or other glass bottle, some thin sisal rope and a glue gun to save another treasure from the recycling bin! The bottle I used was an unusual shape which I think adds to the appeal. I just wrapped and glued until the rope covered the bottle. Click on any picture below to see how the flower came together. (By the way, I missed the photo step about stitching the petals: I just folded the circles into quarters and did a running stitch along the curved edge, then pulled it tight to pull the petals together to form a flower shape). 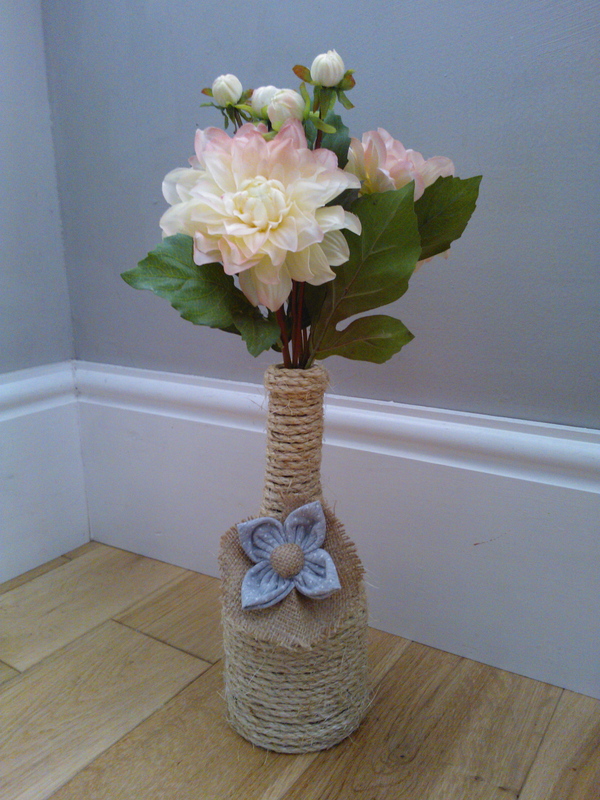 I finished it with what I hope are realistic-looking fake flowers from the garden centre. As you might suspect, I find it quite hard to throw away things that look useful. 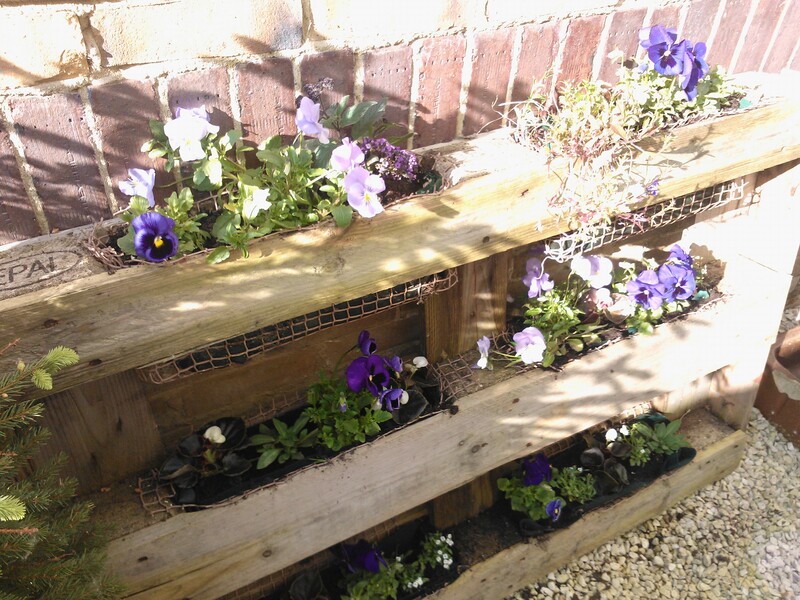 These pallets came to us with a delivery of DIY materials and have lurked half-buried in the shrubbery for months! We couldn’t get rid of them (and I could barely move them!) and we knew we wanted to do some sort of upcyclage with them – but what to do? 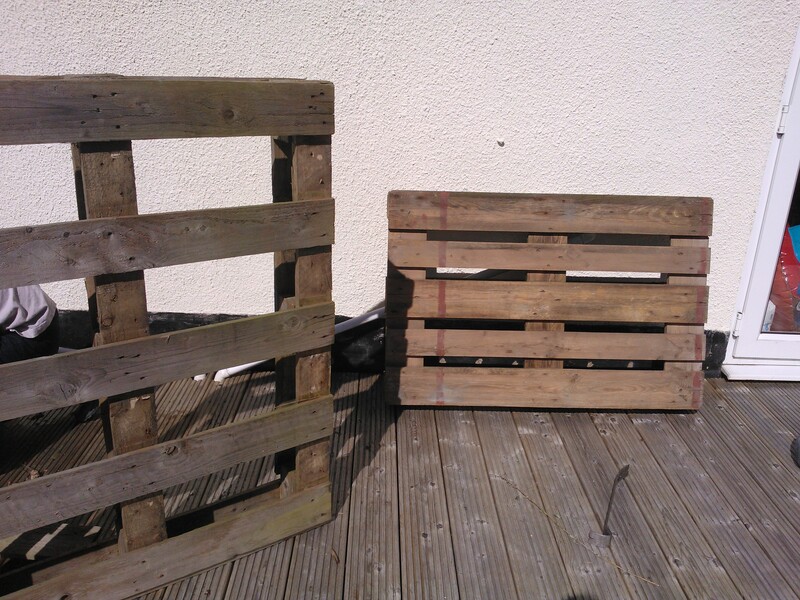 These pallets were crying out to be lovingly converted to a new use! 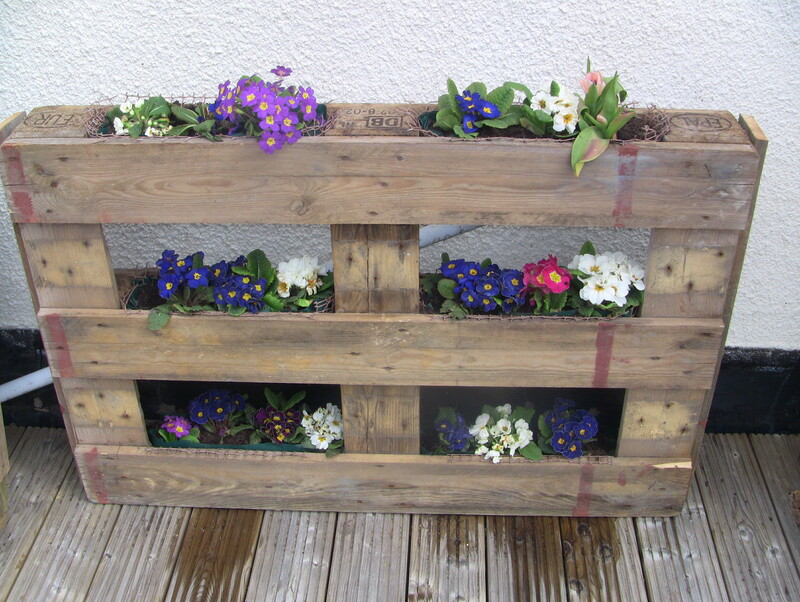 This beautiful reuse came to my attention and I decided to make vertical planters with them: http://lifeonthebalcony.com/how-to-turn-a-pallet-into-a-garden/ However, having carefully prepared the first pallet with landscape fabric and started to add soil we found it was going to be quite an involved process, as you have to lie the pallet flat and pack it very tightly with compost and plants to prevent soil leakage. This method also requires patience (in short supply in my garden!) 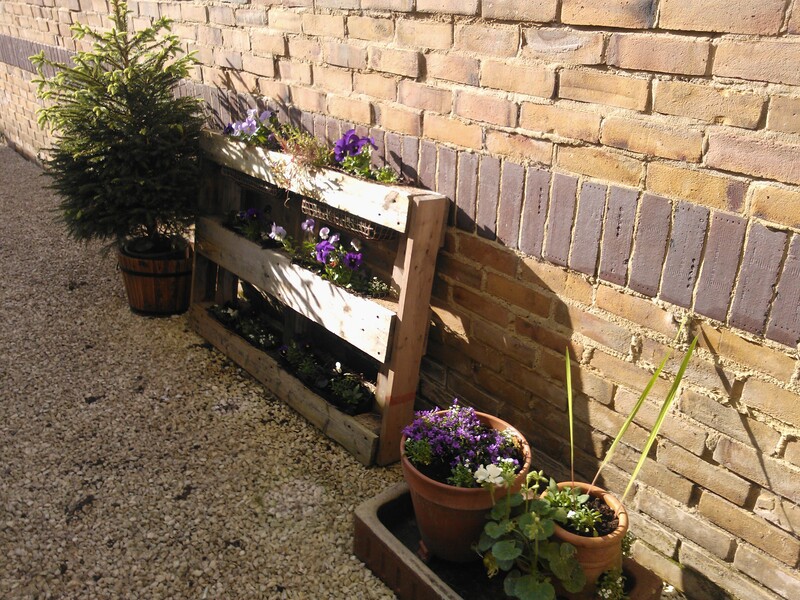 as you should ideally leave the pallet flat on the ground once planted for a couple of weeks or more for the plants to take root. OK, so that method is definitely good but on hold for now here as we need to get loads more plants and have one or two weekends of more clement weather! The taller of the two pallets is therefore prepped but not yet planted. 4. After trimming the fabric a bit to hide it (quite fiddly) we planted the baskets up. Bear in mind as with all small containers in the garden it takes a fair amount of checking and watering during dry spells but if you’re too heavy-handed it will pour muddy water all over the decking!